Today, 20 years ago, we’re arriving the mediterranean sea, but we won’t see it until tomorrow, read more to find out why. 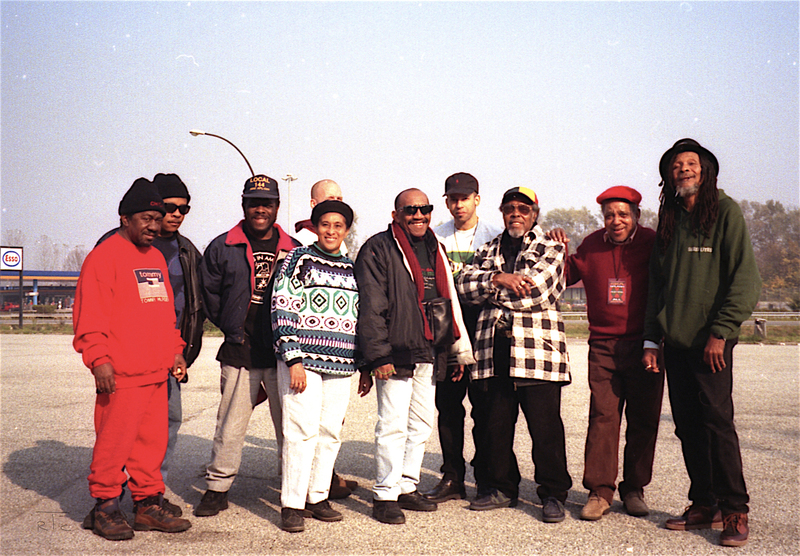 On the road to Quiliano, Vin the manager asked for a photosession with Laurel & The Skatalites. I took some pictures with my camera too. The official pictures are made with Laurel Aitken’s camera. 7.16 PM we’re arriving in Quiliano (near Savona), the weather is not very friendly, but we’re still lucky, no rain. A very strange guy is coming my way, and asks me, if I agree, that he is the M.C. for tonight, his name is Mr. Puma. I see the flyer and I feel myself proud. I love especially the part with “plus DJ CLAUDE from London”. Great, in Marghera I was Jamaican DJs and now, I’m a DJ from London, not bad. I love it. And I really don’t care about Mr. Puma, he is very italian, a nice guy. The catering is not appetizing. And the diner is a Lasagne from microwave. It’s quite horrible. Italy is the country of great food, but the Skasplash tour is treated not with great dishes. It’s a long waiting, almost 5 hours, we’re trying to relax in this enormous sports hall. It’s cold and there is no nice waiting area. Vin explains, that the Hotel is too far to take a rest over there. Bill Smith and I are playing frisbee with an old drum skin in this big hall. Lloyd Brevett is asking me for a picture with all the beard wearing guys on this tour: himself, Barney and me. 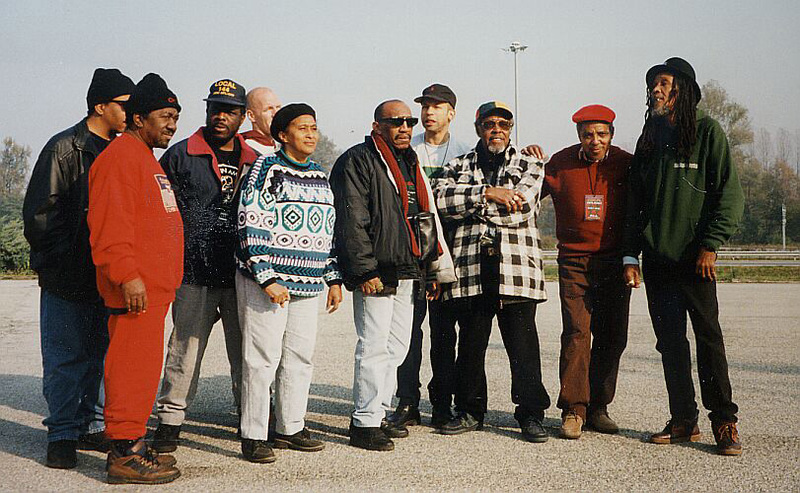 We take the picture in Hamburg with Laurel Aitkens camera. While we’re waiting, I go to explore this area. Outside is almost nothing, but flats. Not one store in the closer area. And if there would be something, it’s already closed anyway. Inside the hall I find a boxing area. I hit the boxing bag heavy. Over here I meet Kirk Thorne. He can’t see the sense in such a tour. He tells me to leave the tour in Munich, when nothing is changing. It’s really not easy for all of them. 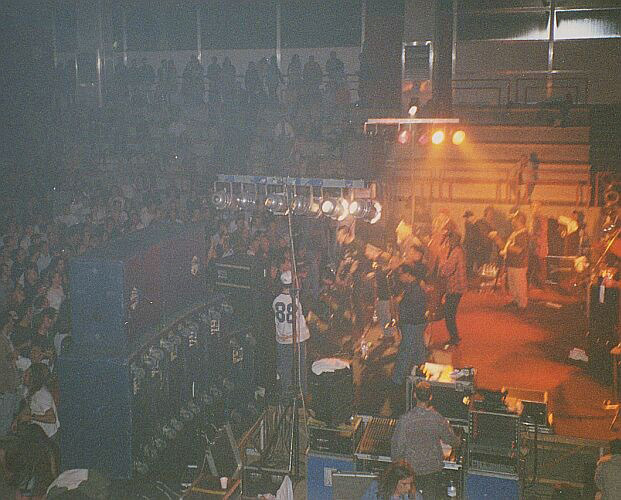 On the stage is a DJ-set with two turn-tables only. I looks quite dangerous to me. 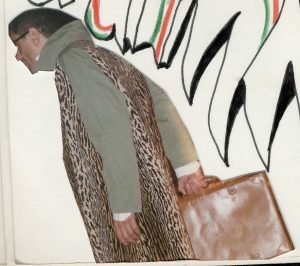 This is the beginning of the show, presented in Italian by Mr. Puma, the M.C. for the evening. His introduction including DJ Claude from London (that is me). 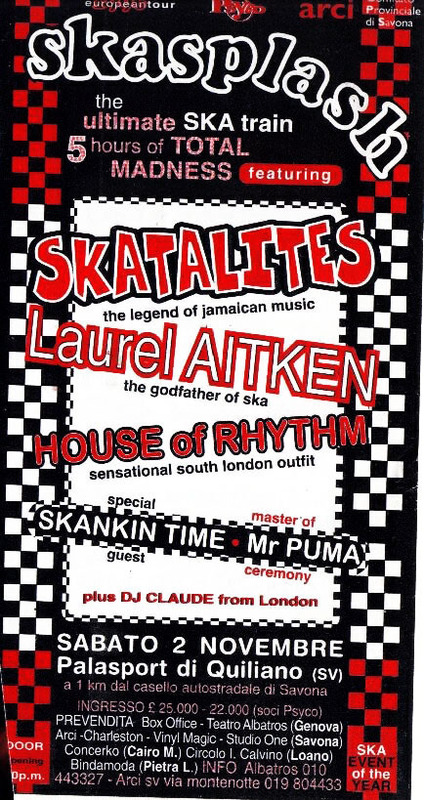 His introduction ended with “Skankin’ Time”, the well known Italian Ska/Reggae band to warm up the Skasplash 1996. 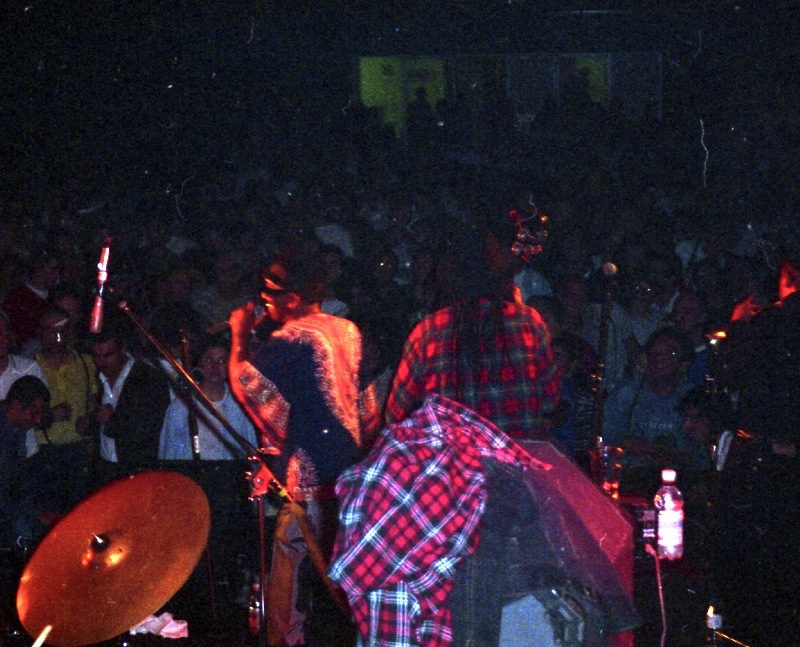 I remember Skankin’ Time from Genova played a nice version of Peter Tosh’s “Johnny Be Goode”. Here’s a sound example. The hall is full with about 2000 people. It’s a massive crowd. The next audio clip is Cutty Williams introducing House Of Rhythm’s “Headcharge”. 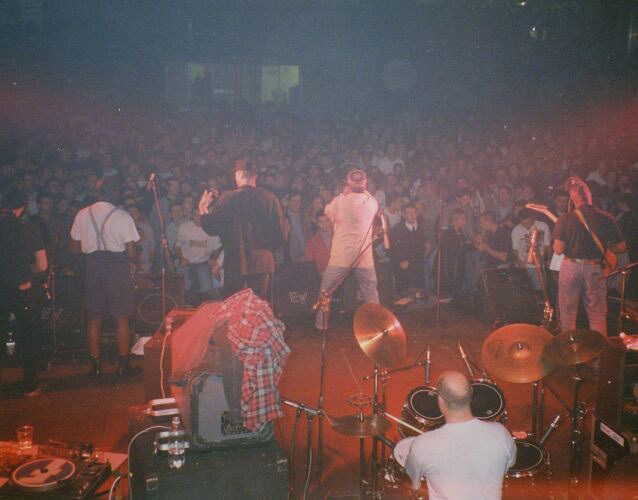 This is Ska music with a message. Listen well, what Cutty have to tell. And this next clip is the great tune “Headcharge” by House Of Rhythm. Listen to the great Tony Looby playing this very nice flute (whenever some of the band telling me to play the flute instead of Tony, I would never ever take this part!). On this sheet there is the note of 7 hours of waiting. I don’t remember well, but, the waiting was boring and cold. Mr. Puma also asked House Of Rhythm for a short appearance. Between the show, I was on stage with the turn-tables and Mr. Puma is coming with his DJ to do his style. I’m not sure, if the audience really likes that, but who cares. They made a big show and it was a big show. 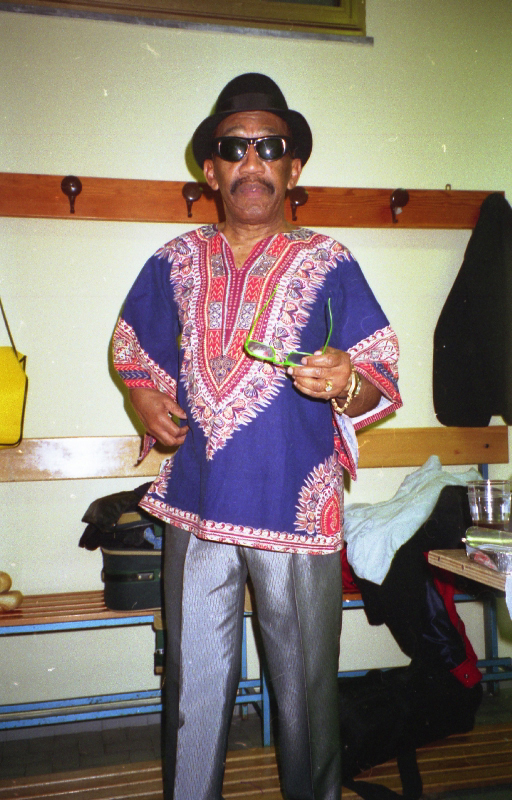 Laurel Aitken is posing to me in the backstage. He really enjoys to be a star. I love you. Listen to my voice. I’m embarrassed, when I hear that, but I guess it’s the single recording of my voice from the Skasplash tour. I just don’t remember, why I ask the audience for more of House Of Rhythm, this audience is not really the right for their sound. However here’s the sample. Before the Laurel Aitken show, Vin is asking me to introduce the merchandise stand upstairs. I guess it’s my first spontaneous speech in front of 2000 people. 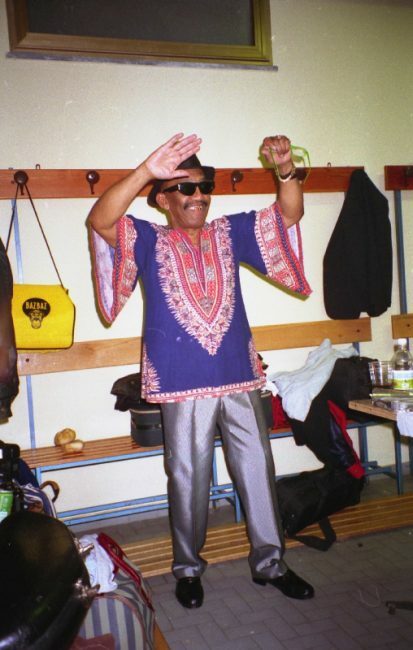 Then the stage is free for Laurel Aitken. Sound call Sally Brown to mash up the town. This short introduction illustrates the massive character of the show. While Laurel is on stage, there is a dog running on stage. Shay has a lot to do to protect Laurel also from fans. 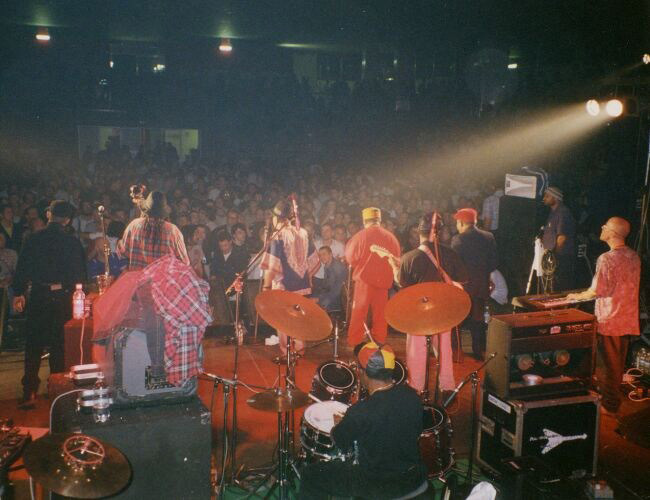 When the Skatalites take the stage, the audience is already out of rage. Completely mad. Remember yesterday – 20 years ago – they made that soundcheck while they tried to fix this tune and it ended in a disaster on stage. But in this version only the massive hit by Lloyd Knibb remembers to that session, but the rest is perfect. The whole hall is crazy. There are some people with massive flags they throwing. And twice the neon light is flashing up. There is no security left and the door is open for everyone. It’s big mess. The mess is also backstage. Where my tourpass is stolen. At the end of the show, there is Phoenix City. Rolando Alphonsos solo is crazy, followed by Will Clarks “Let’s twist again”, Lester Sterling comes next. I observe the engineer, while he’s recording the shows on the mixing desk. I tell him, that this is not allowed and take the tapes and keep them. Until today. 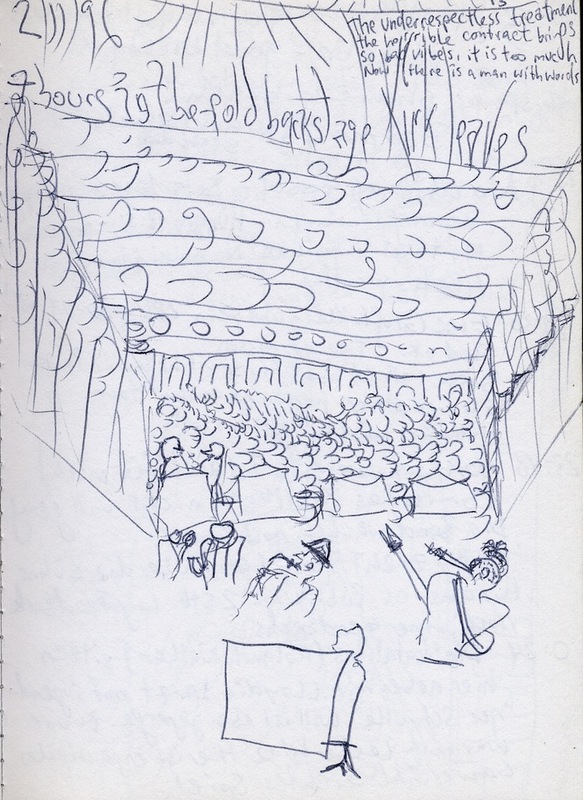 On this blog is the very first presentation of some of the recordings. I guess everybody agree with me, to give this tunes out not for business but for the memory. Hope you’ll enjoy. After the show, we’re expecting a real long way to the hotel, but in fact, it is not far at all, about 5-10 minutes! At that time we have no idea, that the mediterranean sea is that close. We’re arriving at the hotel, it’s 3 o’clock AM. A few hours asleep and it’s already breakfast time. After breakfast I take a little walk, but when I see the mediterranean sea that close, it’s only 50 meters from the hotel. But that’s the story for tomorrow. 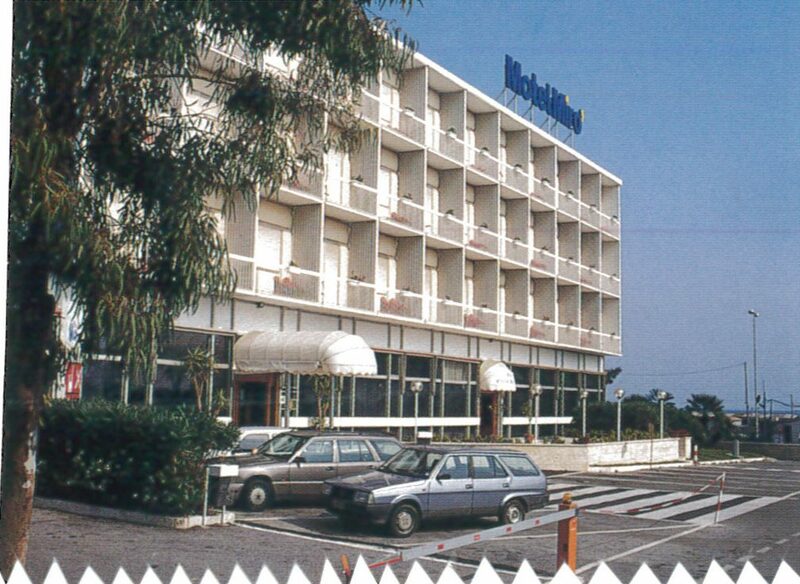 hotel: check-in after show, only 5 minutes from the club, just beside the sea, why we had to wait 7 ! hours in that cold palasport? no time in the morning, for a little bath in the sea, but why? 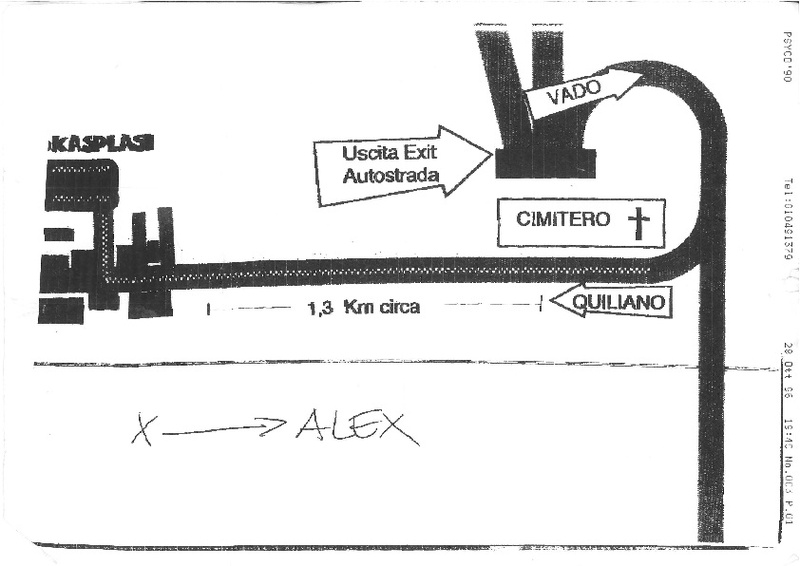 Come back tomorrow, to read about the story in Torino.